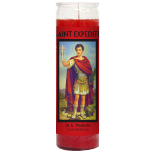 Saint Expedite I will give you a proper slice of pound cake and a pure glass or fresh water to thank you for what you are doing for us at this moment. I asked you to get some rude tenants out of my place and this you are doing right now as I type. Not only are they moving but they are going in peace and with lightening speed thank you again, for you again Saint Expedite....pound cake and water will be yours asap. Date Added: 04/29/2018 by M. H.